The more I prepare for our next lesson, Collage 101, the more I realize that in order to be successful and to really understand what to do to achieve the results you want, is to have a working knowledge of the art supplies you will be using. In this short informational prequel, I will be giving you great links that will explain some products and processes in depth. Here is a great link that will explain the difference between artist grade and student grade acrylic paints. 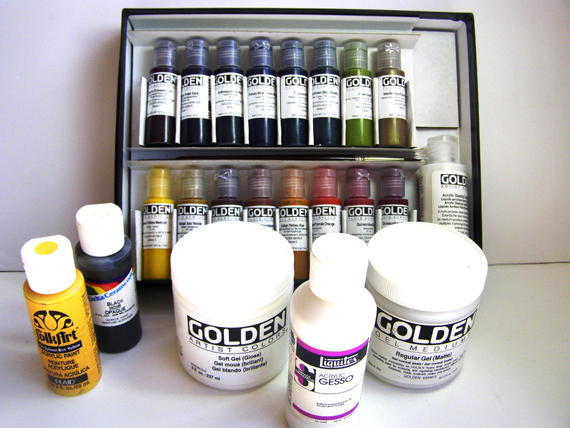 I have a preference for artist grade acrylic paint, Golden brand in particular. For collage I use the heavy bodied and/or the fluid Golden acrylic paints. The heavy bodied paints are thick and creamy, have a high pigment (color) load and are most suitable for brush painting. Fluid acrylics are great for pouring or splattering…then using a tool like a pallet knife to move the paint around. Here is a a fantastic link that will explain everything about gels & how to use them. Again, I have a preference for the Golden brand line of gels. Most come in 3 lusters (1-Matte, not shiny, 2-Semi gloss, a little shiny, 3-Gloss, very shiny.) The ones I use the most are; the Regular, Matte and the Soft Gel Gloss. There are different consistencies of these gels also, as you’ve probably noticed with my mentioning Soft Gel Gloss. All will be explained at the link I gave you! Here is a link for MORE than you need to know about gesso! I usually use the white gesso when I collage, because I use it for a base to write or draw on. There is clear, black and colors available. This is the one thing I am MOST excited about!If you are looking for a photographic art paper that you can use in any wet media application…”Magic Matte” IS FOR YOU! It doesn’t matter what kind of water-soluble ink your printer uses, the special coating on the primary surface renders even dye based ink waterproof! Comes in 3 weights. It doesn’t split when folded, a must have for any wet media, collage artist and paper crafter! I use this paper exclusively for any wet media application, even regular printing when I want a wonderful color representation that is truly high def and foldable. Wonderful for the Scrap Girls Hybrid projects! Never start a collage with a preconceived idea as to how you want it to look! The color, YES – photos and/or printables, YES…..
A Collage takes on a life of its own…it will let you know what it wants to look like! Stay tuned for more Art Journal Collage Scrap Girls style!